Don’t ignore changes coming with new Johne’s rules on June 30, particularly if you sell cattle, stud or commercial, across borders into the Northern Territory or Western Australia. That was a central message from the Futurebeef-Beef Central webinar on Johne’s Disease yesterday. Those who don’t make the necessary changes by June 30 could suddenly find themselves unable to access important long term markets, Livestock Biosecurity Network’s Rachael O’Brien warned. Producers at most risk include the many Queensland or South Australian cattle producers who sell cattle for live export out of Darwin. Included are producers from Queensland and WA who sell cattle to AA Co’s Darwin abattoir. Also affected are stud producers from SA, Victoria, New South Wales and Queensland who regularly sell bulls into southern or northern WA. Most States have agreed to deregulate Johne’s management from June 30, 2017, meaning that in those States, Johne’s will now be managed on farm like many other diseases, such as Pestivirus. Johne’s is still a notifiable disease, so if producers detect cattle with Johne’s like symptoms, they must report it. In the past if a producer notified of a Johne’s incursion, their property was placed under quarantine and had movement restrictions placed up on it. Now, in Qld, NSW, Vic, SA and Tas, how a Johne’s detection is dealt with will be up to the producer themselves, depending on the level of Johne’s assurance status and market access they wish to maintain for their herd. However, Western Australia and the Northern Territory have taken a different approach, and will continue to maintain a higher level of cross-border controls over cattle entering their jurisdictions. That means that producers from other states wanting to maintain access to WA and NT markets must ensure they meet their standards. Those producers will in effect have to have a vet approved biosecurity plan in place on their properties by June 30, have a herd check test showing their herd has tested negative to Johnes’ for a minimum of five years after the last confirmed clinical case (if at all), and submit to ongoing triennial herd check tests. More detail was provided in yesterday’s webinar on the steps producers need to take to maintain market access. J-BAS stands for Johne’s Beef Assurance Score. The J-BAS is a scoring system that provides a guide to other producers as to how JD is managed on that property. The highest score is J-BAS 8, which requires the property to complete a vet approved biosecurity plan, two successive negative sample tests two years apart and ongoing triennial check tests. 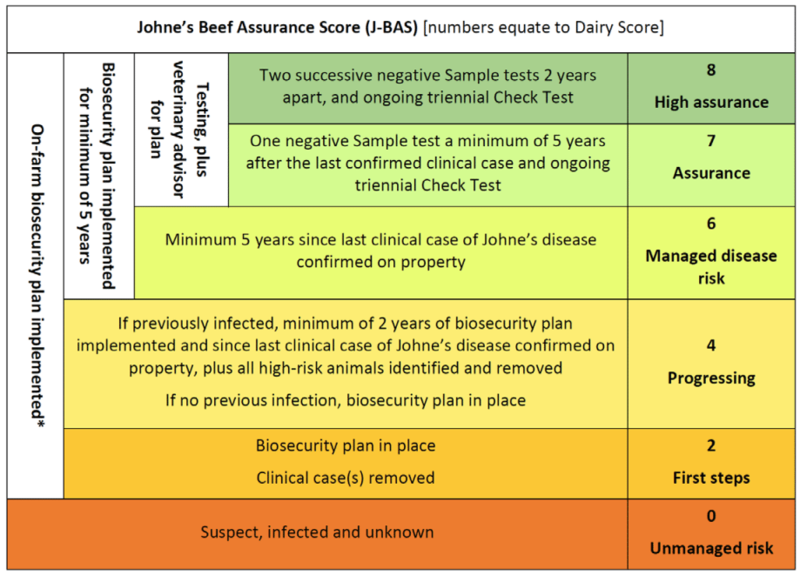 The next status down is J-BAS 7, which requires the property to complete a vet approved biosecurity plan, one negative sample test a minimum of five years after the last confirmed clinical case of Johne’s on the property, and ongoing triennial check tests. JBAS 6 requires properties to be able to prove that a minimum of five years has passed since the last clinical confirmation of Johne’s. WA are maintaining Johne’s control measures at level JBAS 7, and the Northern Territory has also implemented interim arrangements which also require a minimum of JBAS 7. So when the current transition period finishes on June 30, 2017, producers wanting to sell into WA or NT must have a biosecurity plan in place that addresses the elements of the JD checklist, and is overseen by a veterinarian. If producers do not have a plan in place by June 30, then they will need to engage with their vet, undergo a check test and await the results to be eligible for JBAS 7. “If you get your plans in place in next couple of months before the June 30 cut off, then you are most likely going to be a six or a seven,” Ms O’Brien told the webinar audience. “If you don’t (before June 30), you can then obviously obtain that JBAS 7 by going and doing testing and getting negative results and jumping back up to that JBAS 7. She stressed that producers really should be looking to act before June 30. “You must implement a biosecurity plan before June 30. “That is certainly going to be the most easiest way to maintain market access. “We can’t stress that enough. All the documentation I have read so far regarding J-BAS has been around ensuring you are a J-BAS 7/8 when selling to WA and/or NT. How does all this apply to the local markets, particularly QLD? For example: if we are a J-BAS 7 property, can we purchase J-BAS 6 bulls/cows? are we able to quaritine a J-BAS 6 Bull until test then use in the J-BAS 7 herd? Any advice you can provided would be greatly appreciated.